The ambiguity of the term “merry-go-round” makes it difficult to pin down an exact symbolism intended by the propagandist—which is, without a doubt, exactly what he (or she) intended! Recall the discussion from reign czech, pt. 2, where we examined the brilliant use of the rhetorical question in this zoo world ad. If we are unable to determine exactly what type of device is meant by “merry-go-round,” a degree of uncertainty attaches itself to the term in our subconscious. We are uncertain, meaning we do not fully understand what is intended by the ad’s author. Recall the great axiom of tolerance: “we fear what we do not understand.” If we do not understand the exact meaning of the term, we therefore fear the term. And fear, my friend, is the most powerful weapon in the propagandist’s arsenal. It is time to continue connecting the dots. Last time we covered the history of the carousel in an attempt to gain insight regarding the merry-go-round element of the facebook ad’s query line: “Why have a Merry-Go-Round when you can have a Ferris Wheel?” There is a vast difference between a glorious Dentzel carousel (in a classic American amusement park) and a humble soviet carousel (in some Eastern-Bloc playground overlooked by scrap-metal looters). However, it would not be technically incorrect to use the term “merry-go-round” when referring to either entity. If we are afraid of the first choice, the second choice already has the upper hand on the battleground of will—before we’ve even considered it! We are in danger of choosing, of making a judgement, before all the facts are in. This is prejudgement. This is prejudice. Already prejudiced against the first choice, the second choice buttresses its attractiveness with an implied promise of power: “when you can have a Ferris Wheel?” (emphasis added). The imperative that follows (“put one in your Zoo!”) underscores the implication. 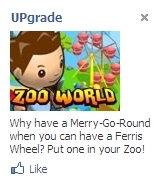 Not only can I have a Ferris Wheel, I will put one in my Zoo! Such thoughts are only natural as we respond to the master propagandist, who is softly stroking our ego with seductive promises of power. When I am in control of my own destiny, when I am master of my own zoo, there is nothing to limit my options. I am in charge. This is egotism. This is pride. This is pride and prejudice at work in the propagandist’s rhetorical question. We do not see a question and a command. We only see a promise of power. Just as a child must learn to crawl before he (or she) can stand and walk upright, the turkish, ottoman, and arabian precursors to the carousel were spinning long before the first pseudo-ferris wheels showed up. Unlike the pre-carousel, there are no Byzantine bas-reliefs or crusader communiqués regarding an upright wheeling-ride-thing. In fact, it wasn’t until the 1600s that we might anachronistically detect a twinkle in the London Eye. 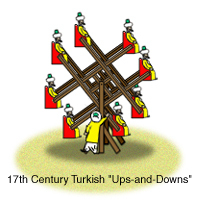 Those of you versed in the seventeenth-century travelogues of Pietro Della Valle and Peter Mundy no doubt recall descriptions of ferris-wheel-like contraptions that were rolled out for Islamic festivals in Constantinople or the Ottoman Balkans. Unlike the carousel, however, nobody took the idea and ran (or rolled) with it for another two-and-a-half centuries. It was 1891, and Chicago had the whole world coming to town. The World’s Columbian Exposition, booked for 1893, had the windy city on global display, and every patriotic expositionist was looking forward to Chicago’s turn at hosting the World’s Fair. What they really needed was some really big, fancy structure to serve as an iconic centrepiece; something “original, daring, and unique.” The [iron] bar for this sort of thing had been set by the French a couple of years earlier. 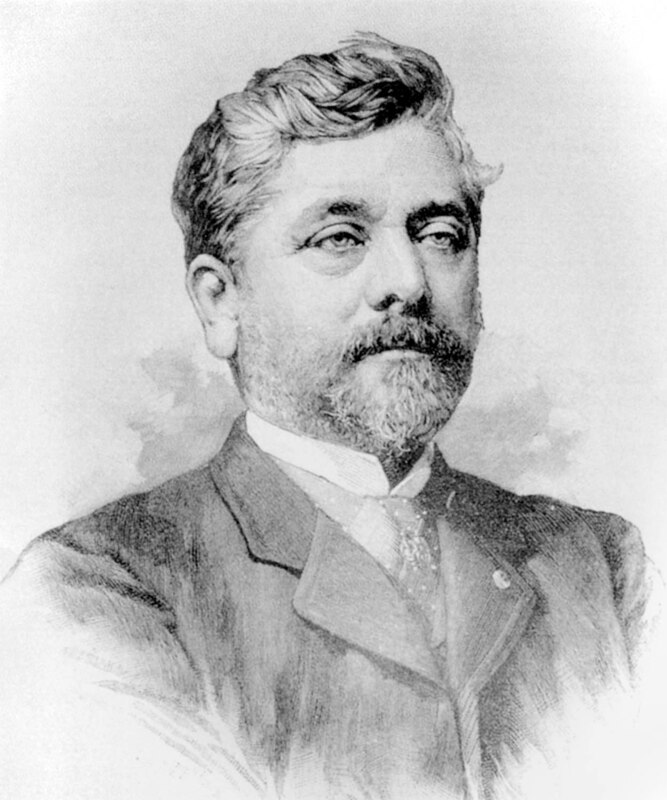 Commemorating the 100th anniversary of the storming of the Bastille, Paris unveiled Gustave Eiffel’s wondrous erection for the Exposition Universelle of 1889. The French had thown down a thousand-foot-tall puddled-iron gauntlet, and it was up to Chicago to show the world what America could do. Enter: George Washington Gale Ferris, Jr., a man with a patriotic name, a glorious vision, and a couple hundred tons of steel. The planners were less-than-enthused about his really big wheel idea . . . they tossed it out as unrealistic. I guess “original, daring, and unique” also implies “realistic.” But, when Ferris came back with endorsements from a few rock-star caliber engineers (and $400,000 from private investors), the planners gave him the go-ahead. The Ferris wheel, unlike Eiffel’s ferrous tower, was a thing of steel beauty—not to mention an amazing feat of engineering. It had 36 cars, each with 40 seats and standing room for another 20. That’s 2,160 folks riding on a 264-foot wheel of “unrealistic.” Ha! where was this guy in 1897? 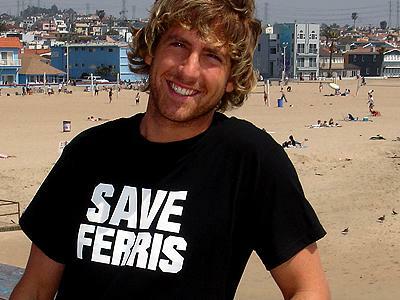 The planners had the last laugh, though; they screwed Ferris out of his share of the $750,000 profit his wheel brought in. Ferris fought it out in the courts for the next two years (probably enough time to get through the first phase of discovery), but to no avail. When he died of typhoid fever in 1896, the undertaker held his ashes ransom for unpaid funeral costs. It was over a year before anyone ponied up the dough. Since he spent the year as an ashen captive at a Pittsburg morgue, it’s fair to say that 1897 wasn’t a very good year for G.W.G. 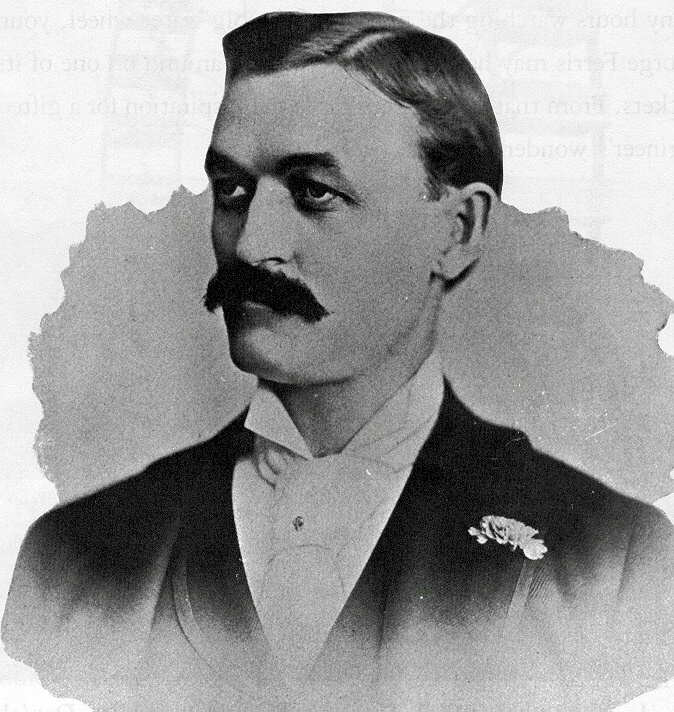 Ferris, Jr. It was a good year, however, for his namesake wheel, as one of the most famous Ferris wheels of all time was built in Vienna, Austria. The Wiener Riesenrad (“Viennese giant wheel”) was constructed in honor of the golden Jubilee of Franz Joseph I, Emperor of Austria, King of Bohemia, and Apostolic King of Hungary. The Wiener was the pride of the empire, and pretty damn impressive—until 1900 when Paris got another go at hosting the World’s Fair and built a taller one. When the Paris Wheel was demolished in 1920, however, the Wiener was once again the tallest in the world. Despite taking extensive damage in WWII, the resilient Wiener continued to turn (after some repairs, of course). It was surpassed by the Japanese in 1985, but the pride of Vienna still stands today. I’m sure Franz Joseph would be proud. History lesson finished. All of the dots are now laid out, some connections are penciled in. In part 5, I’ll wrap the whole thing up and unmask the full meaning of the reign czech ad. This entry was posted in facebook ads, zoo world, zw2: reign czech and tagged bastille day, chicago, eiffel tower, ferris wheel, franz joseph I, george washington gale ferris jr, gustave eiffel, paris wheel, resilient wiener, vienna, world's fair, zoo world by Hank. Bookmark the permalink.